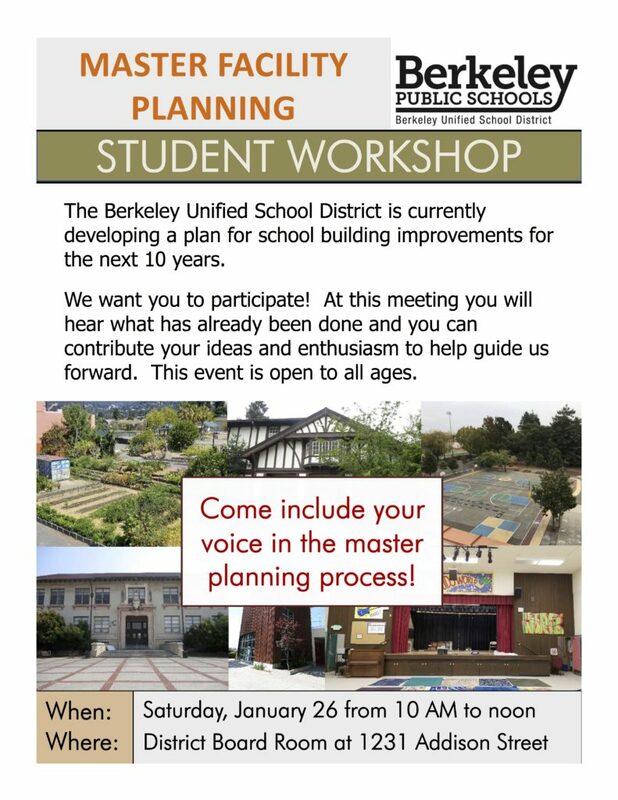 The Berkeley Unified School District is developing a 10-year master plan for our schools and other facilities, and we value your input. You are invited to participate in a student workshop and community meeting about the development of a BUSD Facilities Master Plan. It will be held from from 10 a.m. to noon on Saturday, Jan. 26, at the District Board Room, 1231 Addison Street. Parking is available in an open lot at Addison and Browning. The event is open to all ages. We’re calling the meeting a “Student Workshop” since we especially welcome input from our students, for whose benefit our buildings are designed. The meeting will include information on progress so far in developing the Master Plan and provide an opportunity for community members to ask questions and share their ideas. For additional information, please contact the Facilities Division at 510-644-6066 or facilities@berkeley.net.